INTI College Sarawak’s hospitality students whipped up an array of mouth-watering western cuisine in a show of talent and creativity that delighted an appreciative audience at the institution’s recent Open Day. Chef Shan, INTI College Sarawak’s award-winning chef and instructor in culinary arts, gave teams of competing students a free hand in creating an appetizer, two canapés and a main course from a hodgepodge of raw materials. Each team had to ensure that there was no wastage or unused ingredients once these had been chosen. 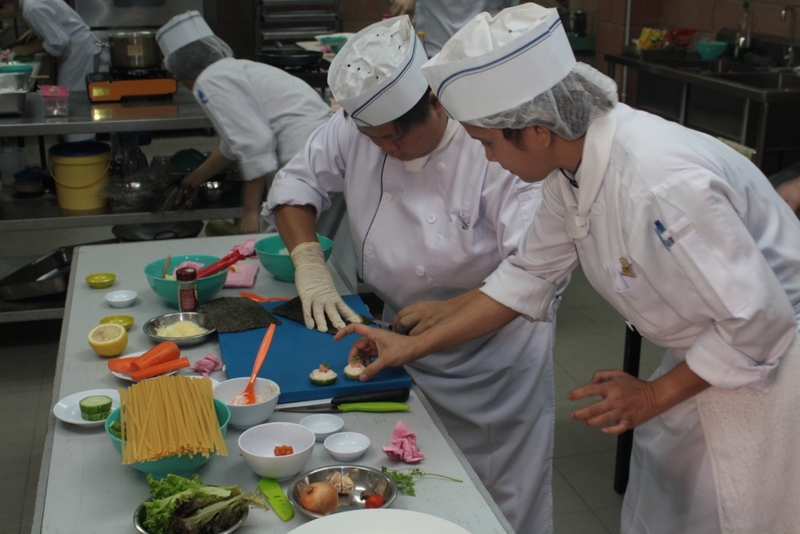 INTI’s hospitality students refine their practical and soft skills as they compete in friendly competition. “The cooking competition was an opportunity for our hospitality students to display their latent and acquired abilities as they raced against the clock to come up with tantalizing dishes that appeal to the senses of the discerning judges,” said Chef Shan. Each team had to present its fare before a panel of judges which comprised of Ivy Lau, Chief Executive and Principal of INTI College Sarawak; Carleen Teo, Head of INTI College Sarawak’s School of Hospitality; Chef Lee Teck Liang from INTI International College Subang; and members of INTI College Sarawak’s management team. Allen Lai Yu Hong and Joseph Ling Chee Huong from the Diploma in Culinary Arts programme won the championship trophy. Second place went to Culinary Arts students Angeline Audrey Colin and Grace Chai Lifern while Eric Rocastle Anak Uchek and Norizan Siran from the Diploma in Hotel Management programme took the third spot. Enrolment for the hospitality programmes is ongoing at INTI College Sarawak for the April 2012 session. For further information, please call 082-570888 or visit INTI College Sarawak at Jalan Stampin Timur in Kuching.